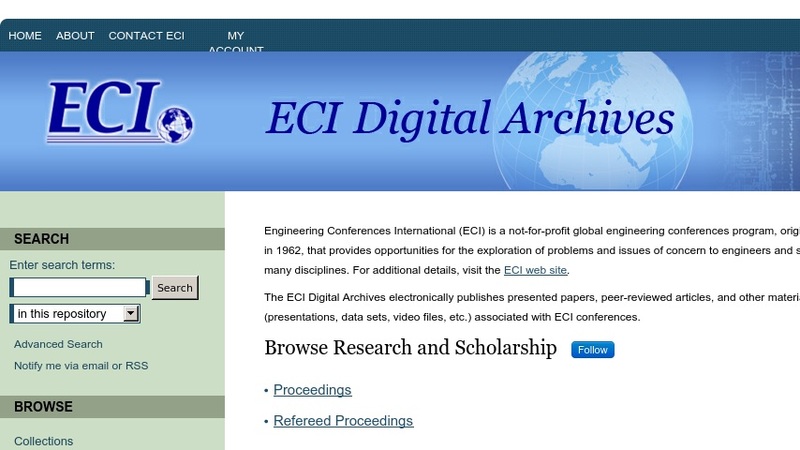 Engineering Conferences International is an electronic journal available through the Berkeley Electronic Press "to provide conference organizers with a new publication option--a highly visible, rapidly disseminated outlet for conference materials." The ECI program sponsors interdisciplinary scientific/engineering conferences through the Engineering Conferences Foundation and Polytechnic University. They publish this series, which includes presented papers, peer-reviewed articles, and other materials (presentations, data sets, video files, etc.) that are associated with ECI conferences. Visitors can browse by year or subject and download the materials free of charge. Other publications, such as journals, working papers, monographs, and newsletters available through Berkeley Electronic Press (see also Scout Report for Business & Economics, April 5, 2001), can be found by following the link to "bepress."